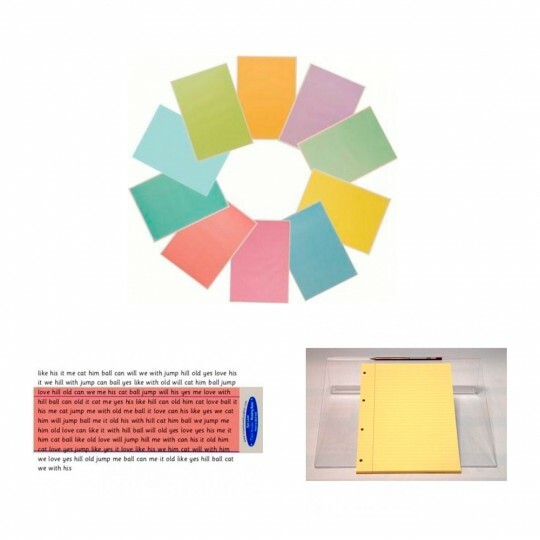 Coloured reading overlays can increase reading speed by 25% or more for people who suffer from visual stress. Our range of six colours accurately meets the criteria recommended by top visual scientists and optometrists. Visual stress occurs in about 35% of people with dyslexia, so while all weak readers should be assessed for visual stress, not everyone with dyslexia will necessarily benefit from coloured overlays. People with visual stress often find it as difficult to write on white paper as to read from it. Writing can be untidy and presentation poor, because the words they write are affected in just the same way as the printed words they read. Writing on tinted paper can help improve their presentation, the speed of writing and reduce the number of mistakes made while writing. They have 100 pages (50 sheets) with 8mm lines and a wide (34mm) margin.